3 bottles of medium bodied Tempranillo packed with cherry and berry fruit; 2 bottles of unoaked, crisp Blanco and a dry Rosado that’s great for entertaining. 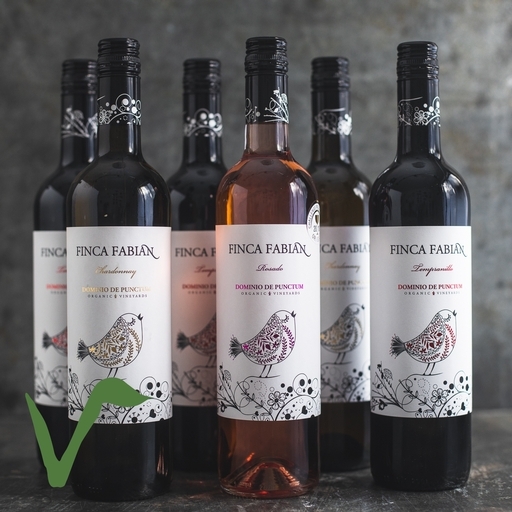 3 Finca fabian tempranillo 75cl: 100% Tempranillo, Alcohol 13.5%, sulphites 50mg/l, produced in Spain, Suitable for vegans. 2 Finca fabian blanco 75cl: 100% Chardonnay, Alcohol 13%, sulphites 60mg/l, produced in Spain, Suitable for vegans.